These cordless window blinds are designed with an exclusive cordless lift that holds the blinds securely in place when raised and lowered. Simply lift or pull on the bottom rail and stop the blinds in the desired position. the cordless lift increases child and pet safety. Our child safe cordless wood blinds come with a cord tilt control is still used to tilt the blind open and closed. 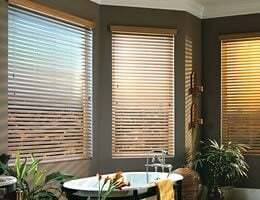 Our Signature 2 1/2 Inch Cordless Wood Window Blinds are made from the same wood slats as our Signature 2 1/2" wood blinds so the colors match. Note: A lift and lock button is on the center of the bottom rail to raise and lower the blinds and lock in place. Beautiful blinds, perfect fit, and easy to install. Beautiful blinds, perfect fit, and easy to install. I couldn't be happier. I have 3 very large bedroom windows (67" x 38"). too short in width but I was able to center it so its not noticeable unless under scrutiny. The only issue that really bugs me is that when the blinds are down, one side sits on the bottom window sill while the other side is a 1/4 inch short. (previous blind didnt have this problem) Next time I replace another window, I will order a 1/2 inch longer in length to try avoiding a repeat of this. One last thought-these are not routless so you do have some light sneaking into the room from the cord holes and when shut, they don't shut as flush as the routless blinds did. So, take that into consideration before ordering these. Overall, discounting the little flaws I mentioned and the fact there are no chords to pull them up that can break, I think they are great for the price and look really nice and expensive. Shipping to CA took 3 weeks.